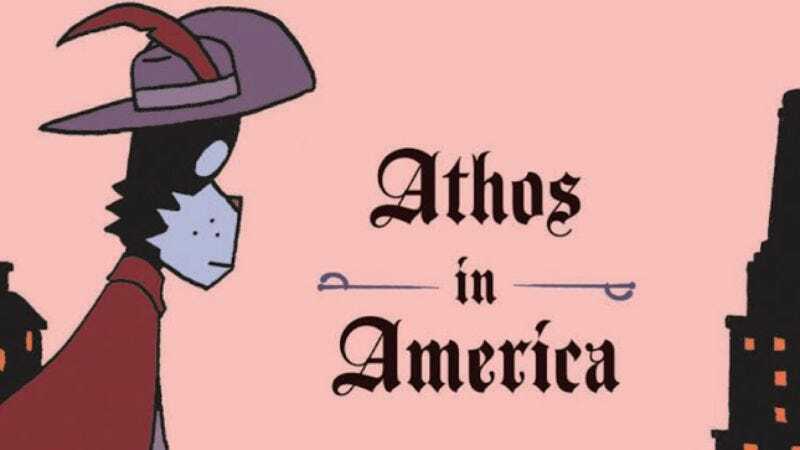 Any new work from Norwegian cartoonist Jason is worthy of a comics fan’s full attention, but the new, all-original short-story collection Athos In America (Fantagraphics) is one of the best books of Jason’s career, which automatically makes it one of the best books of this year. The title story comes last, and strands the hero of Jason’s graphic novel The Last Musketeer in 1920s New York, where he tells a bartender about his disastrous Hollywood romance. “Athos In America” serves as a neat summary of a book that’s all about dislocation and the perils of love, and it’s also a masterful example of Jason’s style, in which the surface emotionlessness of animal-headed figures conceals deep passion. Even the way most of the action in “Athos In America” takes place off-panel reflects the character’s sense of being away from where he wants to be. Is this, at long last, the time of Tom Gauld? The Scottish cartoonist has been slowly building his reputation over the last decade, via strips, short stories, anthology contributions, magazine illustrations, and art books that have been graced with his deadpan humor and precise, minimalist designs. Goliath (D&Q) may be the book that garners Gauld the wider recognition he deserves. For one thing, it’s a fuller piece than anything he’s produced before: a recounting of the Biblical tale of David and Goliath from the point of view of the giant, who’s a reluctant draftee into a war he’d rather not fight. (Picture Karl Pilkington as an 8-foot-tall soldier in thin brass armor.) For another, while Gauld still keeps the dialogue to a minimum and the page/panel designs open, there’s an actual story here, not just one beautifully drawn joke. And the story has points to make, too: about how perception creates reality, as Goliath’s mere presence intimidates the Israelites, and also about how even an army’s biggest weapon is just another cog in an unstoppable, insensitive war machine. A lot of great Gauld comics remain uncollected or hard to access Stateside, but Goliath makes a fine introduction for the uninitiated, both for the alternately funny and poignant scenes of its hero waiting forlornly on the plain for something to happen, and for Gauld’s art, which is typically on-point. Working with cartoony figures, silhouettes, and finely cross-hatched close-ups, Gauld captures the bleakness of the landscape, and how what looks like an insignificant pebble from far away can become hugely important when it’s landing right between the hero’s eyes. Australian cartoonist Pat Grant doesn’t have a résumé as impressive as Jason’s or Tom Gauld’s, but his debut graphic novel, Blue (Top Shelf), is still stunningly accomplished. Simultaneously impressionistic, collage-like, fantastical, and down-to-earth, Blue mostly follows a trio of teenage beach bums as they skip school to surf, then get sidetracked by a quest to go see a dead body on the railroad tracks. (The nod to Stephen King’s “The Body” is intentional, as Grant explains in the book’s extensive end-notes.) Though Grant’s characters are thumb-headed freaks, their dialogue is flavorfully profane, and true to the way adolescents try to one-up each other and gross each other out. Blue then surrounds the story of these kids playing hooky with an extended flashback to when they were even younger, and snapshots of who’ll they’ll become when they’re older. And Grant connects all this to the history of the fictional town of Bolton, which is eventually overrun by blue-skinned, tentacled aliens. Or at least Grant attempts to connect it. At times, Blue feels like two uneasily co-existing books: one a vivid slice-of-life, the other a way-out allegory about immigration and bigotry. But both halves of Blue are exciting on their own, as are the little lyrical interludes and design experiments Grant throws in along the way. This book is eccentric, but it never feels like anything other than what Grant wanted to make: a surf-punk-scored reflection on old friends and the roots of racism. As with Jason’s work and Gauld’s, Grant’s Blue is a wholly original, enormously entertaining comic, heralding a new talent that we may be enjoying for decades to come. As much handmade art as comic book, Zak Sally’s Sammy The Mouse: Book One (La Mano) collects the three issues of Sally’s offbeat funny-animal comic, which Fantagraphics originally released via its European-styled “Ignatz” line. With the help of a Kickstarter campaign, Sally raised the funds to self-publish this edition—and that’s self-publishing in the truest sense, since Sally printed each copy of Sammy The Mouse on his own printing press. The difference is noticeable; every letter and line in this book looks like it’s been deeply etched into the thick paper stock. The painstaking approach to the reproduction suits the fervid quality of the actual comics, which recalls Jim Woodring in the surreal, almost stream-of-consciousness storytelling, and Tony Millionaire in the frequently intoxicated, violent cast of cartoony characters. But Sally has his own preoccupations: the difficulty of maintaining civil relationships, the seeming pointlessness of everyday tasks, and the capricious cruelty of the giant person who lives in the sky. Sammy The Mouse is still ongoing, but this collection makes a strong case for it as a classic-in-the-making, simultaneously funny, scary, and visionary.